“Places possess a marked capacity for triggering acts of self-reflection, inspiring thoughts about who one presently is, or memories of who one used to be, or musings on who one might become… When places are actively sensed, the physical landscape becomes wedded to the landscape of the mind, to the roving imagination, and where the latter may lead is anybody’s guess.” – Keith Basso, Wisdom Sits in Places, 107. Just as I read these words last week, the Toronto Star disclosed municipal plans to close three of the City of Toronto’s ten museums. 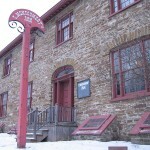 Montgomery’s Inn, Gibson House and the Zion School House – museums outside of the downtown core and closely allied with the Etobicoke and North York Historical societies – are on the chopping block due to municipal cutbacks. This decision builds on the recently announced closure of the Air and Space Museum at Downsview Park, one of a few other museums in the north end of the city. In an age of austerity, as Sean Kheraj noted last week, all public institutions supporting culture and heritage are vulnerable. But these cuts do not just reflect cutbacks in the culture and heritage sectors. In a city already bereft of recognized historical sites outside of the downtown core, this municipal decision reinforces urban and suburban differences in how Toronto’s past is told. If places have the power to shape our self-perception and how we situate ourselves in the world, as Basso and others have suggested, how has the uneven distribution of historical places influenced the culture and politics of Canada’s largest city? Take a look at this map. On it, I have coded Toronto’s proposed and existing heritage conservation districts in green, municipal museums in blue, and the three museums slated for closure with red pushpins. Notice the centralized distribution of sites deemed worthy of preservation. Most are located in the pre-1998 City of Toronto and few are located in the other former boroughs of Metro Toronto. Historic properties are similarly distributed. Within the boundary outlined on the map lie 12,258 of Toronto’s 13,660 heritage properties (about 90%). What emerges is a gap in historical interpretation. One part of the city is steeped in officially sanctioned historic sites; in the other part, the past is almost entirely absent from the city’s landscape. Now take a look at another map. 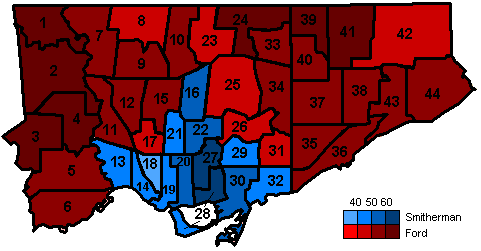 This map reflects voting patterns in Toronto’s 2010 mayoral election. A similar image emerges. People living in the historic core of the city voted one way; people living on its periphery voted another. Although there are lots of reasons that account for this similarity (interestingly household income does not seem to be a factor), I would like to suggest that perhaps some of these differences have emerged because of the way that the past has been used and not used to construct a sense of place in Toronto. Recognizing historic sites has an important role in protecting architecture, determining the design of new buildings and shaping the city’s network of parks and roads. In other words, it helps to determine how urban residents live and go about their daily tasks in their city’s spaces. Historic places also build connections to those people who lived in these places before, establishing patterns of continuity and discontinuity with the past that shape our outlook for the future. In the core of Toronto, I wonder whether the more prominent presence of the past helps to foster a greater sense of collective identity and corporate welfare than elsewhere in the city. The differences in how the past has been interpreted in urban and suburban Toronto stem from the city’s development. Historic Toronto was where the city slowly took birth. It had the highest population, better infrastructure and was more heavily industrialized and developed. As it expanded, it consumed agricultural areas that were less dense and more easily developed. For many, these were empty spaces whose history remained to be written. This interpretation, though, reflects a particularly pernicious view of the past, which – as social historians have emphasized for the past couple of decades – excludes just as much as it explains. Neither the historical downtown nor ahistorical suburb was developed from pristine forest or abandoned farmland. The space that comprises Toronto today is one with many stories. In every part of the city, there is a physical legacy of an Aboriginal presence, the arrival of non-Aboriginal farmers, the building of industry and lives of workers, and the process of urban development. Sites like the Parson’s site along the Black Creek, aircraft manufacturing at Downsview airfield, and the development of highway 401 shaped how people conceived of the spaces around them in the north end of the city. In the core of the city, though, this story has been better displayed in public spaces and official commemoration, building a stronger sense of civic identity and community. Outside of the core, the tale of change over time and urban evolution remains silent. There are few spaces beyond the perimeter of the downtown core that encourage people to consider the city’s diverse pasts and the experiences of those people who lived there before. Isolated from the contexts of the past, people in these places are left to build different forms of community, less anchored to place and the lessons of the past. In Toronto, and many other cities, inscription of the past onto the urban landscape has been used to build different places and different visions of urban identity. The closure of these museums exacerbates these differences and creates a larger chasm between the everyday experiences of those living in Toronto’s core and those living elsewhere. Equally as important, though, these closures encompass the three museums most closely identified with local historical societies for the former boroughs of Etobicoke and North York. If successful, the result of these closures will be a further simplified public telling of Toronto’s past as a historical urban core and an ahistorical suburban periphery. Toronto historians have voiced their opposition to these cuts in an open letter to Toronto’s city council. You can voice your opposition to the proposed cuts by signing a petition. Also, you can visit Zion School House during the next Approaching the Past workshop (Secret Lives, Affective Learning: Using Drama to Teach History) on November 29th. Click here to RSVP. You havn’t addressed what seems to me an obvious issue. Tourists like things that are close together. Many politicians likely think of museums as tools to entice tourists to visit a city. To the extent that historical preservation and memory are about tourism you are correct. But if one looks closer at Tom’s argument, it is that knowledge of a neighbourhood’s history and culture are important for its residents and not just tourists. He is also emphasizing that the dynamics of a historical urban core and a dehistoricized periphery cause residents of both regions to see each other as seperate. Toronto is plagued by an anger between the pre-1998 city and other boroughs that has made its politics disfunctional and created things like the bike/car fights that are not prevalent in other cities. By taking away a belief in the cultural value of inner suburbs like Etobicoke it is furthering a belief between btoh groups that the other is somehow different and contributing to Toronto’s disfunctional condition. I should note the link below to a good article by Tristram Hunt, MP for Stoke-on-Trent Central about the benefit of museums to his constituents. Adam has a good point here. I know when I first read your post I thought of Montgomery’s Inn, which isn’t located far from where some of my family lives. It’s right at the busy Etobicoke intersection of Dundas/Islington, and I must have passed it a hundred times growing up. But it’s an intersection dominated from cars, not far from the subway but an unpleasant walk under a train overpass, and a commuter is more likely worried about making his/her turn or such than thinking about the Inn. And it’s well off the tourist path, to put it mildly. That said, Tom has a good point too. Right next to Montgomery’s Inn is a very high-density pocket of very tall apartment buildings (picture here http://g.co/maps/kt7sc with the Inn in the upper right). I’ve had friends who lived along Mabelle and the area is very, very heavy with new Canadians. I suspect Montgomery’s Inn doesn’t resonate with them: poor marketing, larger issues, etc. But there are TONS of people within a 5 minute walk of Montgomery’s Inn, and I suspect almost none of them have ever gone (myself included, until an Approaching the Past event). Wish I had answers, rather than just questions, on this front.. Yes, it is quite interesting that all three buildings are far from the city centre. It’s a shame. History outside of the historic city centre does tend to get overlooked. But these days, the folks at city hall are thinking only in terms of money. I can see why they picked the museums they did – the Zion Schoolhouse, for instance, is only open to pre-booked groups (no tourist dollars there) while Gibson House has no kitchen facilities and only two small rooms available to rent out (for weddings, meetings, etc – a great way to earn extra revenue). Funny that they chose to close Montgomery’s Inn, however, which had one of larger rooms to rent (up to 70 for a sit-down dinner, according to the website) and not, say, the Scarborough Museum, which has no kitchen and can fit only 16 people. I would actually disagree that a place like Montgomery’s In does not resonate with new Canadians. As a former historic interpreter I can say with certainty that New Canadians make up a huge portion of the City Museum’s annual attendance. This is in part because of a great program called the Cultural Access Pass that provides recently inaugurated citizens with free access to City Museums, as well as places like the ROM and AGO. A VERY worthy program that makes new citizens more invested in their adopted homeland. However, even without the CAP program, immigrants are a big market for these types of museums. I recently heard from a woman who was on a tour with me at a City Museum tell me that when she came to Canada 20 years ago from Pakistan, she was amazed at how we preserved our history for future generations. In fact she said it was a major reason she decided to settle in Canada! This woman openly admitted to me that she had voted for Ford because she thought he was really going to clean up the waste. Imagine her surprise when museums ended up being considered part of that waste. That day she brought her daughter and mother to visit a historic house – thus passing along these values to two other generations.